> Events in North Carolina > THOU ART LLC opening night, Open Mic! THOU ART LLC opening night, Open Mic! Poets, Vocalist, Musicians, Comedians, and Artists alike! 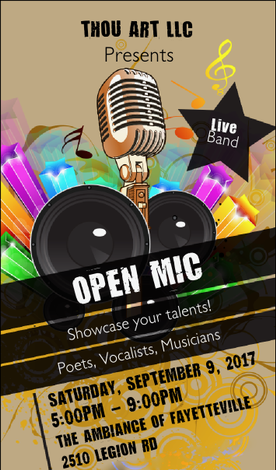 Showcase your talents at THOU ART LLC's opening night, Open Mic!